When you a stay at Cliff Hotel Rügen - Resort & Spa in Sellin, you'll be next to a golf course, just steps from Ruegen and Southeast Ruegen Biosphere Reserve. Featured amenities include express check-in, dry cleaning/laundry services, and a 24-hour front desk. Event facilities at this hotel consist of conference space and meeting rooms. Guests may use a train station pick-up service for a surcharge, and self parking (subject to charges) is available onsite. 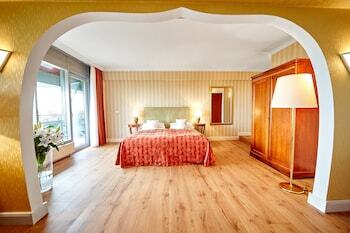 The Bad Hotel Ueberlingen is a contemporary city hotel. Your perfect choice for both business and leisure accommodation. With a stay at Hafners im Allgäu in Kisslegg, you'll be 15 mi (24.2 km) from Muhlturm Museum and 15 mi (24.2 km) from Isny Market Place. Free self parking is available onsite.